Digital Signage Expo is the world’s largest international tradeshow dedicated to interactive display technology, digital signage, and digital out-of-home networks. It’s a great way to discover technology that will draw attention to your business, increase sales, generate buzz, help save on overhead, and improve interactions with your customers. HomeToys.com was a Media partner with DSE 2013 and features a Special Newspage devoted to all the News, Announcements and Information coming out of this years event. Click here for our DSE 2013 Newspage. 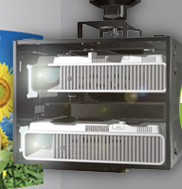 Casio's Dual Projection System combines two LampFree Projectors and projects overlapping images onto a single screen with 6000 lumen brightness; approximately twice the brightness of a single projector. The Geometric Correction System aligns both images and this provides a sharper and brighter projection good for large screens in restaurants, pubs, and sports bars. 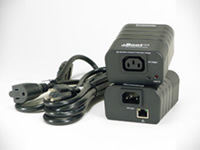 UHBX-P1 is an extender kit from Hall Research that utilizes HDBaseT technology. It can send HDMI, IR, bi-directional RS-232, and PoH (Power-over-HDBaseT) to 500 ft (150 m) on a single Cat6 cable. The extender uses only one +5v power supply, internally creates 48v PoH and complies with IEEE 802.3af handshake. The P1 extender's sender unit provides power to the receiver. In standard mode the UHBX-P1 supports DVI and HDMI signals of virtually any resolution up to 4K x 2K to 330 ft (100m), and in Long Reach mode it supports resolutions to 1920×1080 to 500 ft (150 m). The devices are housed in compact and sturdy metal enclosures and have convenient mounting provisions. They are designed and manufactured in the USA. Planar Mosaic is the only video wall solution that allows designers to mix-and-match three different LCD display tile sizes and shapes into unique arrays not possible with traditional video walls. With Planar® Salvador® – a trend-setting 1:1 aspect ratio square video tile, Planar Mosaic provides unique opportunities for creativity with digital displays in the same form factor as other building materials. Planar Mosaic LCD tiles incorporate energy-saving LED backlight technology and boast a thin installation profile of less than four inches, making Planar Mosaic compliant with the Americans with Disabilities Act (ADA). The DS72LT6 is the largest professional LCD offering from DynaScan, measuring 72-inches diagonally. The display features a full HD 72-inch IPS LCD with an ultra-high brightness LED backlight producing a 5,000 nit sunlight viewable image. The DS72LT6 has been designed for large scale display applications in bright environments such as outdoor enclosures and storefront windows. A narrow 30 mm bezel makes this model ideal for either single display or video wall applications. Each screen is individually color calibrated to the D65 color standard to ensure uniformity amongst multiple displays. 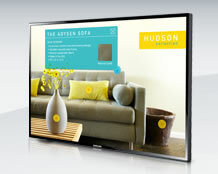 The new Samsung SMART Signage Platform is reshaping the digital signage landscape. The first of its kind, Samsung has combined its industry-leading displays with an embedded open source media player that provides you with a streamlined and cost-effective signage solution. See how it can help your business at Samsung.com/prodisplay. Remote Reboot From Any Browser! Just point your browser to the IP address, enter the Password and you're one click away from power ON, OFF or a timed reboot. Its that simple. The unique Automatic Control features allow iBoot to monitor any IP device on the network and take automatic action whenever the device is down. FaceVACS-VideoScan uses premier face recognition technology to detect and identify persons of interest while computing demographic and behavioral data, supporting security staff, marketing departments and operations management in one application. The application detects people’s faces in live video streams or video footage and stores video sequences of cropped faces (face streams) for each appearance in front of a camera. Hyundai IT's all-weather-capable H461MC 46" LCD Outdoor display is IP65-rated and the screen has 1920×1080 resolution, 1500cd/m2 high brightness, anti-vandal protection glass, auto brightness sensor and RS-232 remote control capability. Media player can install inside enclosure and supports automatic heating and cooling. Armodilo tablet display stands transform any tablet into an interactive media outlet. This uniquely designed system is available in various configurations. The patent-pending Tablet Fit Kits™ support iPad, Android, Microsoft, and other tablets, making the Armodilo the most versatile tablet display stand on the market. 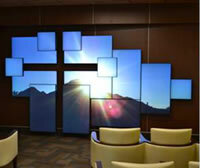 The FUSION series ceiling mounts create eye-catching digital displays right where you want them. 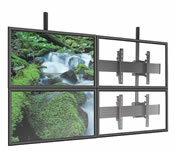 Single mount features include continuous tilt ranges with four set locking points that eliminate guesswork when adjusting multiple screens; simple on/off connection; tool-free latching flags to secure the display; optional padlock security; Centris® technology to provide fingertip tilt; and optimization for a wide range of display sizes. Portrait and back-to-back options will be available soon. The sleek SensyTouch 42" multi-touch table and 60" wall systems provide custom-designed interaction for many industry applications, including trade shows, hospitality, shopping malls, museums and automotive showrooms. "The 32 simultaneous, zero-pressure touch, multi-touch all-in-one systems are the trend for companies that want to change the way they do business," said Suda Sampath, President and CEO of the Irvine, Calif.-headquartered company. The sleek design-only 2.6 inch depth-is among the thinnest design in the industry. The SensyTouch solution empowers and engages an audience whether it's business presentations or shoppers searching for a specialty store in a mall. Information is there at a touch. "Interaction is a powerful tool, one that SensyTouch's wall mount or table top multi-touch screen provides," said Sampath, "We offer a complete package from design to technical support. The end-to-end value becomes evident when the customer experiences SensyTouch in action." Booth visitors could paint on a graffiti wall or play a carnival game on a Christie MicroTiles wall, equipped with a Christie Interactivity Kit. Powered by Baanto™ ShadowSense™, the Christie Interactivity Kit is a complete solution for adding multi-touch interactivity to any rectangular digital display. Modular and scalable for the utmost in flexibility, the Christie Interactivity Kit can be configured into 84 different sizes. It can accommodate practically any large format display up to 21.4 feet wide and 6 feet high, and is also the perfect interactive solution for Christie® MicroTiles®, for arrays measuring up to 16-units wide by 6-units tall. The easy-to-use, field-installable kits are designed in pieces that simply attach around the display wall perimeter and plug into a computer USB port without the need for drivers. It offers excellent performance with high touch accuracy and fast response times that support up to 18 touches on a large-format display. Through its partnership and seamless integration with Dynasign, a leading content-management service platform for digital signage, Magnetic 3D showcased its networked glasses-free 3D digital signage capabilities in Dynasign's Booth #1238. Highlighting a multitude of ideal uses for glasses-free 3D, Magnetic 3D's displays at the show featured complete, end-to-end digital-out-of-home solutions for event marketing and retail point-of sale, hosted on Dynasign's robust Software-as-a-Service platform. 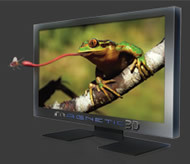 "Together, Magnetic 3D and Dynasign are offering advanced interactive digital signage network solutions and content management for 2D or glasses-free 3D that is priced competitively with traditional service offerings," said Jimmy Dun, Vice President of Business Development at Dynasign. "Glasses-free 3D is extremely effective at delivering elevated engagement. The technology benefits anyone trying to reach the public with information or advertising, as demonstrated by Magnetic 3D earlier this month at Super Bowl XLVII." The EP03r ePoster series features an edge-to-edge tempered glass faceplate with curved corner styling for a differentiating and eye-catching look. With all-in-one functionality, these electronic poster displays have a built-in media player making the sharing of vivid retail messaging a breeze, as well as the ability to add a third party media player or PC due to the HDMI and VGA inputs. Multimedia JPEG, music or video content can also be uploaded using a USB thumb drive or over a network using an external media player for further versatility. Supporting both portrait and landscape orientations, the EP03r series accommodates wall mounting using the 400mm x 400mm mounting pattern on the back panel (100mm x 100mm on the EP2203r).